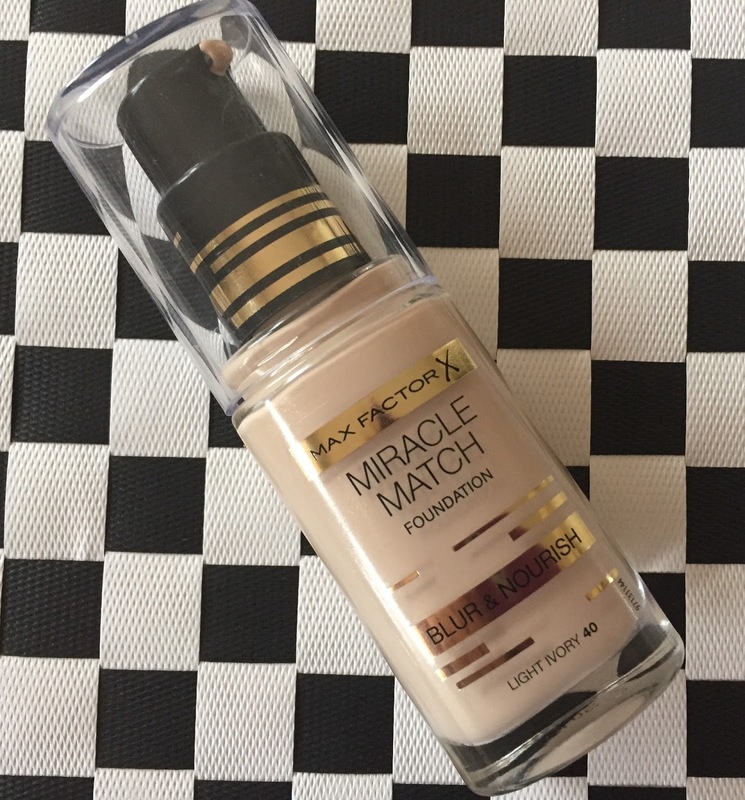 You might recall that I wrote a post about 18 months ago professing my undying love for the Max Factor Facefinity All Day Flawless Foundation - I definitely hold that foundation out as one of my favourite foundations ever, never mind a highstreet foundation. Therefore, when I spied a new Max Factor foundation in very similar packaging, I didn't hesitate in making it mine. The new Miracle Match foundation is Max Factor's new hydrating, gel like foundation that promises to "blur and nourish". I picked up the lightest shade called 'Light Ivory' and I think there are about nine shades available in Ireland but that said, I popped into a smaller Boots during the week and there were only six shades available. I think it's about the €15/16 mark which is pricier than most other foundations in Boots but don't let the price deter you. I have tried a lot of foundations in recent weeks and this one blew them all out of the water. I've been very much looking forward to telling you all about this actually! This foundation feels like a serum or gel when you apply it and immediately evens out skintone and minimises the appearance of pores. It takes a minute or two after applying for the foundation to set down- in fact, I hate this foundation on my skin for first 30 seconds as I feel like it doesn't look like it's blended or buffed properly despite my best efforts but I have come to realise that it takes a minute to dry down on your skin. Now don't be alarmed by this- it's not that the foundation looks matte or powdery, it's quite the opposite really- when you leave this foundation sit on your skin after buffing for just a minute, I find that it just completely evens out, blurs all pores and looks flawless. It feels a little sticky when you first apply it but after giving it that extra minute to set on your face, the stickiness evaporates and other makeup and powders etc. apply easily over it. The finish is quite radiant- dewy but not shiny, brightening and full coverage without looking cakey. I feel that this leaves quite a natural skin finish. This foundation is packed with vitamins B and E and contains high levels of water (1st on ingredients list) and glycerin (3rd on ingredients list) to moisturise and treat the skin. One thing that I am not struck on in this foundation is the smell- it's quite bizarre, like toffee / biscuits - it's not really sweet, it's not that pungent fake tan smell - but I find it quite nauseating and thankfully it completely subsides very quickly after application. You can get an idea of the level of coverage - the foundation instantly evens out the skintone and has quite a radiant finish. I applied the foundation with a flat top kabuki. Makeup applies perfectly and evenly over the top of foundation once it sets down. After 14 hours of wear- very minimal fading around nose area, pores still in tact. Ever so slightly more shiny but held up remarkably well considering I didn't powder or apply primer underneath. As I mentioned, I picked up the shade Light Ivory which is the lightest shade available here- however, it appeared to be a little too light for me currently (must have somehow caught some sunrays over the summer) and I've compared it below to the Light Ivory shade in Max Factor's Facefinity line. The Miracle Match is a smidge paler than Facefinity. 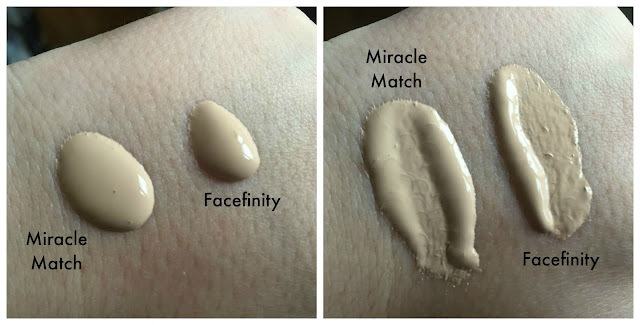 Both foundations perform similarly in terms of coverage and despite the fact that the Facefinity is a 3in1 primer/concealer/foundation hybrid, they also perform similarly in terms of longevity. Overall, my verdict is that this is a very fine foundation indeed and I've been enjoying using it the way I've enjoyed using Facefinity. I definitely rate this one alot more than the new MAC Studio Waterweight foundation which I reviewed recently and it held up on my skin a heck of a lot better. I think this will be perfect for some faux radiance in the winter time and this will be in rotation over the coming months. Have you tried this foundation yet or is it on your radar? I have been using this foundation and I am in two minds about it - sometimes I think it is love, the next time I use it I'm not so mad about it - I think I need to use it some more before I make my final call! Your skin is gorgeous, just thought I needed to add that in! 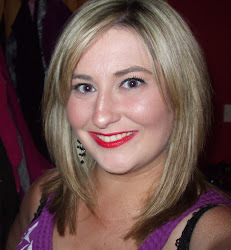 Think it looks like L'oreals Infallible 24H Stay Fresh foundation.